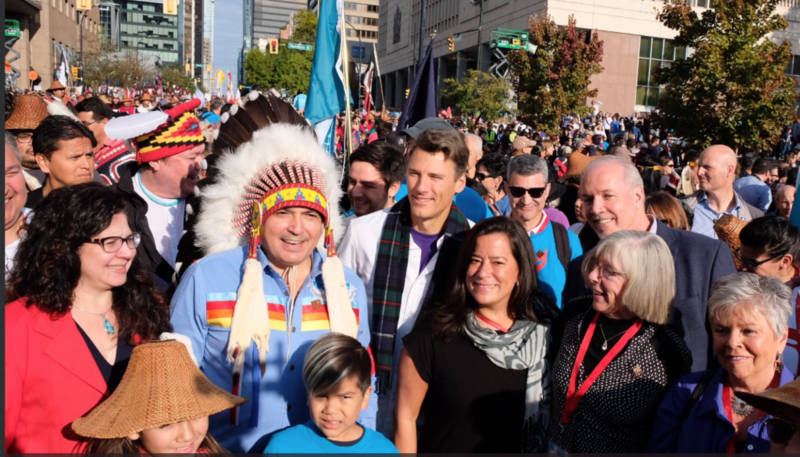 It was a tremendous honour, and a fantastic personal experience to participate in the Walk for Reconciliation here in Vancouver yesterday (September 24, 2017). I thought that Robert Joseph Sr and the Reconciliation Canada team, along with the City of Vancouver did the City very proud. Uncle Bobby, as he’s known to our family, set a fantastic tone for the tens of thousands of participants; as a survivor, and leader of the Reconciliation movement; just as in the first Walk for Reconciliation in 2013, he wasn’t looking to lay blame or guilt, but to spread a message of love and understanding; in coming together as one…’Namawayut’ in our language. I was personally taken aback by the shear number of participants, so many people took it upon themselves to join the walk, join a movement that continues to gain momentum. There were organized efforts by groups from all corners; union shops, universities, faith groups, ethnic groups; and most importantly, just people who felt compelled to participate and make a difference. Of course, there was representation by different levels of government; who were gracious and sincere in their comments, comments that were well received. Its now up to all of us to hold their words to account, to move from words to action. But the day was really about the Reconciliation movement, and those who chose to walk, walk with their families, co-workers, their neighbor; Indigenous and non-indigenous. Congratulations to the organizers, thanks to all the volunteers who made it happen. Most of all thanks to all the participants, all of the people that can see a different and better future, in our territories. Indigenous Governments – Strategic Planning….Why?